(LWI) – As military action against IS occupied Mosul starts, The Lutheran World Federation (LWF) in Northern Iraq is assisting civilians who flee the fighting in and around the occupied city. LWF distribution of boxes with hygiene items such as soap, towels and toothpaste in Debaga. “Even before the offensive to re-claim Mosul, there was fighting and bombing in the area. This has been happening for months. We have seen people fleeing the area around Mosul city and provided relief goods for them,” says Ilona Gajdikova, LWF Program Manager in Northern Iraq. Many of the internally displaced people have found shelter in the Debaga camp, originally on the front line of IS territory. As Iraqi and Peshmerga forces advance, the camp has become a safe haven from the contested area. 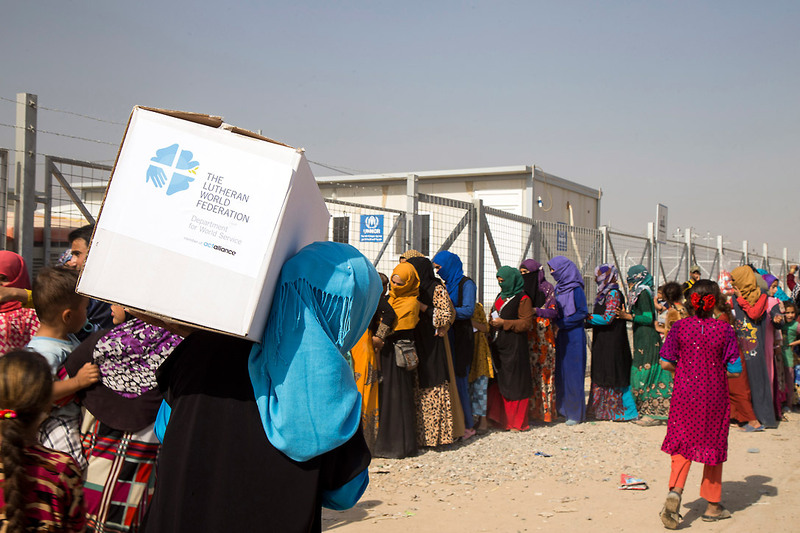 LWF together with local partner Al-Masala distributed hygiene kits to 12,000 people in Debaga last week. The camp now is temporary home to more than 40,000 refugees. Many families with young children are living in tents as the cold season approaches. Children share a cup of yoghurt. 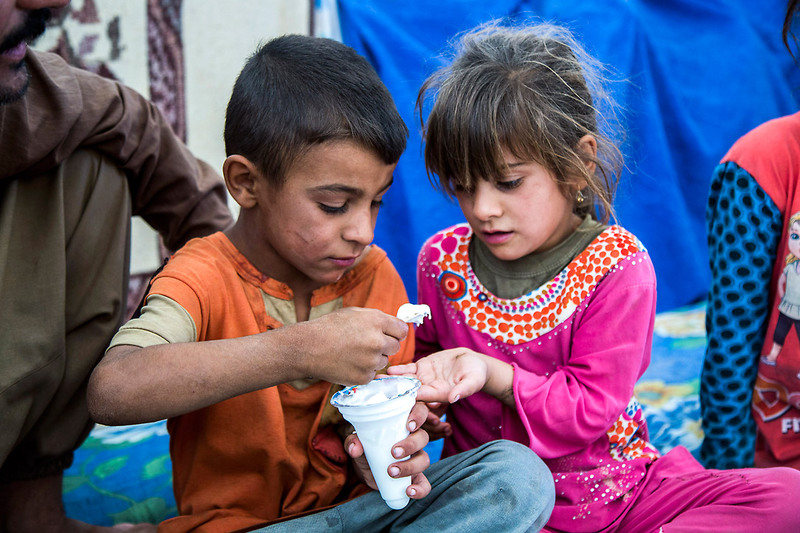 It is estimated that the re-taking of Mosul will displace 500,000 children. LWF plans to support up to 7,700 families with basic relief items such as blankets and cooking pots, hygiene kits, shelter kits, safe drinking water and latrines with septic tanks. “We will also provide psychosocial support to 2,000 women and girls,” Gajdikova continues. Altogether LWF plans to help 50,000 people. Mosul refugees line up for a food distribution. Mosul, Iraq’s second largest city and IS' largest remaining stronghold in the region, was taken in June 2014, displacing half a million people, predominantly Christians and Shia Muslims who were targeted in particular. About 1.5 million remained in the city. The United Nations estimates that more than one million civilians could be displaced by current military action, about half of them children. 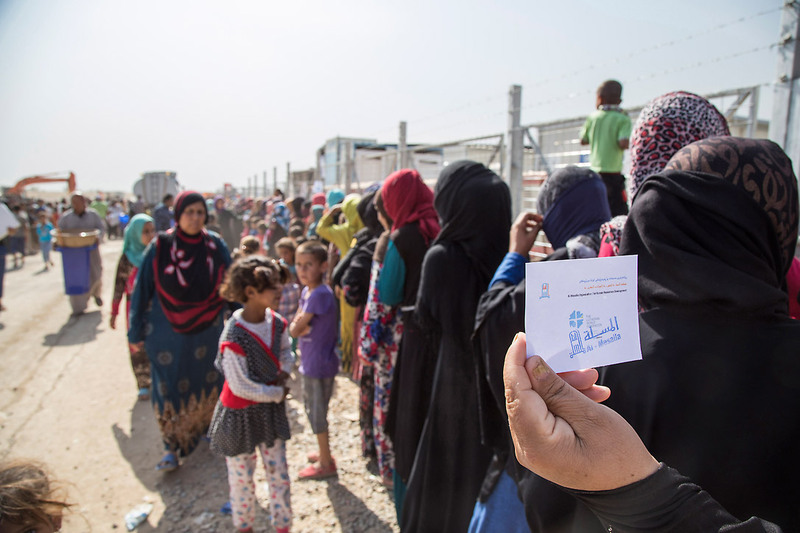 UN High Commissioner for Refugees Filippo Grandi has called for civilian protection to be a part of the strategy for retaking Iraq’s second city. LWF has been present in Northern Iraq and assisted Yazidis, Muslims and Christians displaced by IS in and around Dohuk with food, shelter, water and sanitation, other relief goods and psychosocial support since 2014. ACT Alliance has issued an alert.